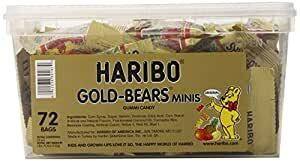 Haribo Gummi Candy,Mini Gold Bears 72 Count Tub/Bag. Each Plastic Tub or Bag contains 72 Bags of Mini Gold Bears. Each bag is less than 1/2 Ounce About the Brand Haribo, founded in 1920 in Bonn, Germany by Hans Riegel, is one of the most prominent manufacturers of sweets (namely fruit gums, licorice, and foam) in the world. The company name is an acronym for “Hans Riegel, Bonn” and stands as a reminder of Haribo’s continuing loyalty to early traditions. After Hans Riegel died during World War II, his son, also named Hans Riegel, took over the factory and expanded its operations, taking over many local confectionery manufacturers in countries all over the world. Currently, Haribo operates five factories in Germany and 13 throughout the rest of Europe. The company also has sales offices in almost every country in Europe as well as in the Unites States. Haribo’s German catch phrase is “Haribo macht kinder froh / und Erwachsene ebenso,” which translates as Kids and grown-ups love it so / the happy world of Haribo.